People love puppies. We experience them as cute, little bundles of love. But while humans find puppies irresistible, many adult dogs do not. The day you bring home a puppy to meet your resident dog may not unfold into the joyful scene you’re imagining. The puppy may be met with a friendly greeting or a physical assault. Your dog’s personality, history and age are all factors in how he’ll respond to a puppy. Introducing dogs to puppies the right way can make a big difference. What is the best way to introduce dogs to puppies, and how do the introductions vary by age? Introducing dogs? Puppies meeting puppies is one of the easiest dog introductions! Photography ©Voren1 | Thinkstock. The younger a puppy, the more likely he is to love other puppies. It’s a rare 12-week-old pup who isn’t happy to see another baby his own age. In fact, the majority of puppies up to a year old enjoy the company of other puppies, assuming they have been socialized with other dogs. An older puppy who hasn’t interacted with another dog since he was taken from his littermates may not feel comfortable around a puppy. If you want to introduce two puppies about the same age, you probably don’t have to worry about them getting along. If the pups are old enough to be on a leash, let them greet one another with humans holding their leashes. You’ll most likely see a lot of excitement from both pups as they go almost instantly into play mode. If you’re adept at reading canine body language, you’ll know right away that it’s love at first sight when you see play bows, low wagging tails and squeals of excitement. If one puppy is considerably older than the other, keep a close eye on them as they interact off leash. When my dog, Mookie, was 12 weeks old, I introduced him to 16-week-old Denali, a friend’s puppy. It didn’t take long for Mookie to become uncomfortable with Denali, who was twice his size. Denali wanted to wrestle, but although Mookie loved to play with Candy, my gentle adult dog, he didn’t appreciate Denali’s wild puppy advances. It wasn’t long before we had to separate them because Mookie had had enough. As dogs mature, they can become less enthused about puppies. Playful adult dogs might appreciate the energy of a rambunctious puppy, but dogs who are mellow and don’t like to play can find a puppy to be extremely obnoxious. Gauge how your adult dog feels about puppies before you allow her unsupervised time with a pup. (Do not allow unsupervised time with an adult dog that doesn’t get along with the puppy.) The way you introduce the dogs can help with your adult dog’s attitude. You’ll need someone to help you with the introductions, because you want both your puppy and your adult dog on leash when they meet. Make the introduction on neutral ground. That means a place where neither dog has spent time and laid claim. Let the dogs approach each other slowly, and allow them to sniff each other. If the puppy starts trying to jump on the adult dog, don’t be surprised if the adult dog growls or snaps at the pup. This is an appropriate response considering the puppy is behaving rudely. Most pups don’t know the rules of dog etiquette and need to learn them. If your adult dog ceases the assertive behavior after the pup backs off, she’s most likely going to be fine being around a young dog. If the puppy doesn’t do anything overt yet the adult dog becomes aggressive at the mere sight of him — growling, snarling, snapping or lunging assertively — end the introduction. Realize that your dog may be a “puppy hater.” Some adult dogs just don’t like puppies. Period. Never leave an adult dog unsupervised with a young puppy, particularly if the adult dog has show aggression toward the pup. Many dogs become less tolerant of puppies as they enter their senior years. My Corgi, Nigel, loved other dogs, particularly puppies, until he hit about 10. By that age, his former love had turned to disdain and intolerance. Senior dogs often have arthritis or other health conditions that render them uncomfortable and perpetually irritated by puppies, who always want to play. Other seniors, while healthy, just find puppies annoying. Most puppies lack social skills and will pounce on older dogs when they want to play. Senior canines seem particularly irked by this and will often school a puppy to teach her how to behave. When introducing a senior dog to a puppy, keep the puppy on a leash and under control. Take the pair to a neutral spot, and let them greet each other. If the older dog ignores the puppy or doesn’t react aggressively to the puppy’s invitation to play, the two will probably get along. That said, don’t be surprised if the older dog regularly puts the puppy in her place once they are living together. As long as she doesn’t hurt the puppy but instead growls or snaps if the puppy nags her to play, accept this behavior for what it is — your older dog is teaching your youngster the rules of being a dog. While your senior will probably do a good job of letting the puppy know how to behave, you still need to intercede if the puppy is particularly annoying. This means giving the older dog a break when the puppy gets too obnoxious. Confine the puppy to a crate or pen to teach her to settle down while also giving the senior dog some peace and quiet. Your senior will be more patient with the puppy if she’s able to get away from her for a while. Can Older Dogs and Puppies Get Along? Older and younger dogs can become great companions, like Beaudry, the 12-year-old Golden Retriever I recently met, and his young friend, Gus the Lab. Gus is lively and rambunctious, while Beaudry is half blind and arthritic. Yet the two have found a way to have a good relationship, despite being in such different places in their lives. Why Are Some Older Dogs Afraid of Young Puppies? 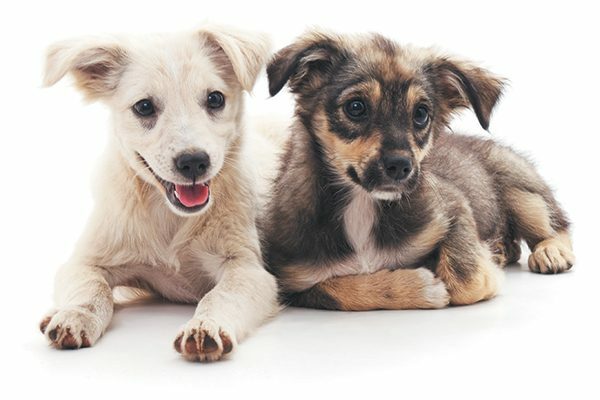 The post A Guide for Introducing Dogs to Puppies appeared first on Dogster.